You read too many comic books! Life – Rebel without a Cause. 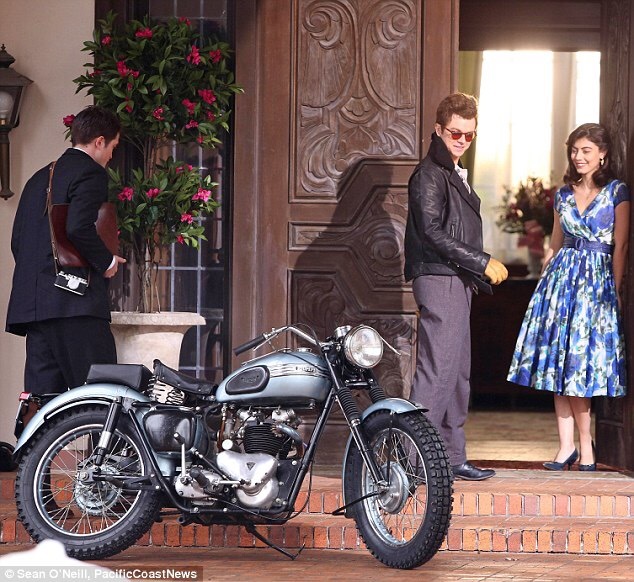 Actor Robert Pattinson plays photographer Robert Stock who recorded James Dean in the mid-fifties. Leather clad Dean is played by Dane DeHaan. 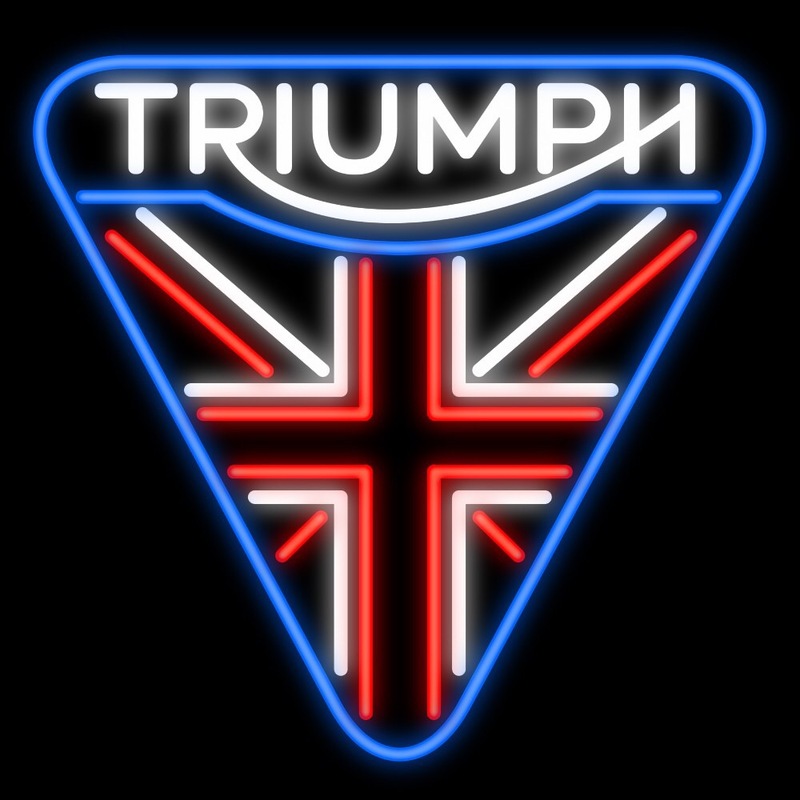 Immaculate 50’s Triumph TR5 Trophy 500. The iconic actors original Trophy is in a restored condition and on display at the James Dean Gallery at Fairmount, Indiana. 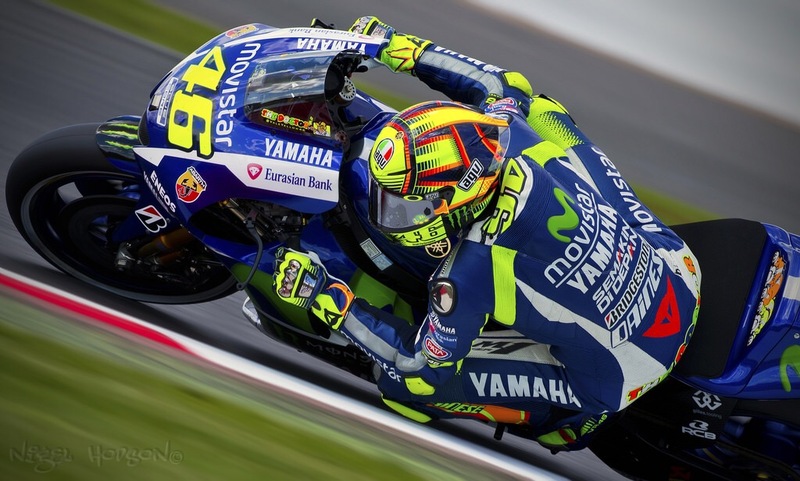 If you wanna be the best, and if you wanna beat the rest! 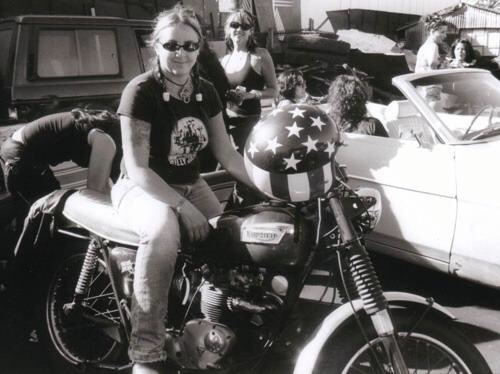 Record Breakers – Last September 539 bikers broke the world record for the longest ever parade of Triumph motorcycles. Their entry fees went into a fund set up by a 29-year-old woman who has had a series of brain tumours since she was four. Jessica Simpkin’s charity at the Children’s Brain Tumour Research Centre at Nottingham’s Queen’s Medical Centre. has now raised more than £31,000 for further research into children’s brain tumours, their early diagnosis and new treatments. 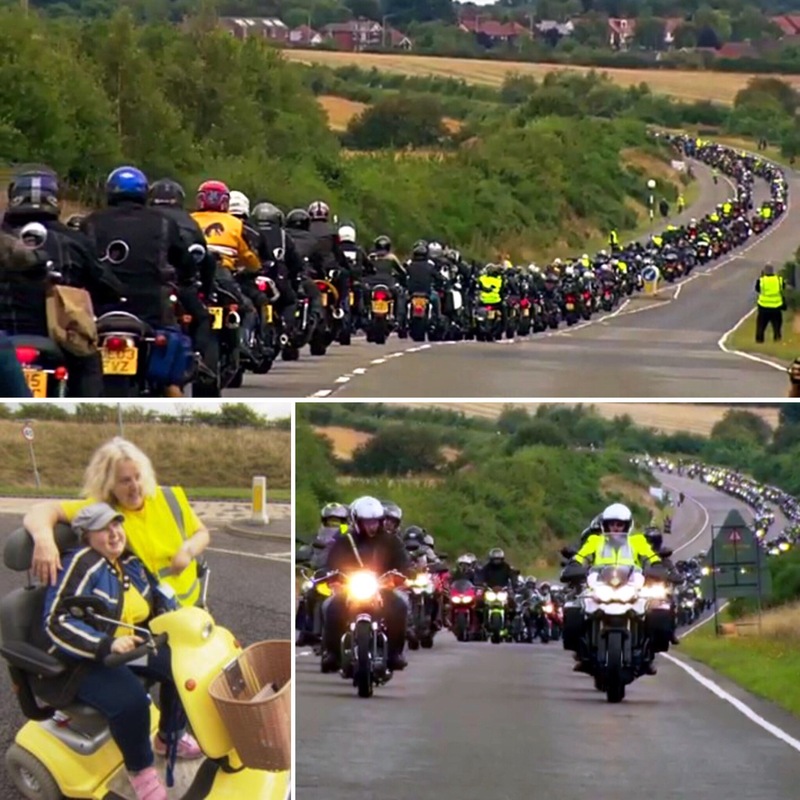 The event was organised by Staffordshire Triumph and closed a section of the A617 in Mansfield, Nottinghamshire. Mostly newer Hinckley models were represented, however some older Meriden bikes were seen in the caravan too. Like some latter day Ted Simon of Jupiters Travels fame, Kane Avellano arrived back to South Shields last week – a day shy of his 24th birthday following an epic 32,000 miles global journey. 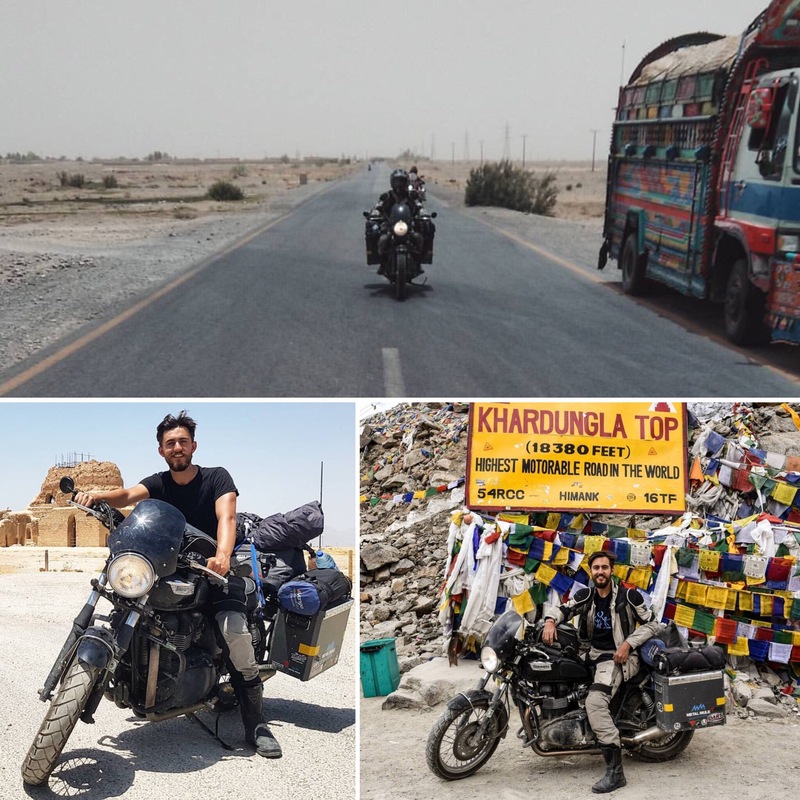 As well as the experience of the circumnavigation he also took the journey as to raise awareness and sponsorship funds for the children’s charity UNICEF. Swiss Watch – slushy roads in Central Europe for some laden travelled passing through neutral Switzerland. 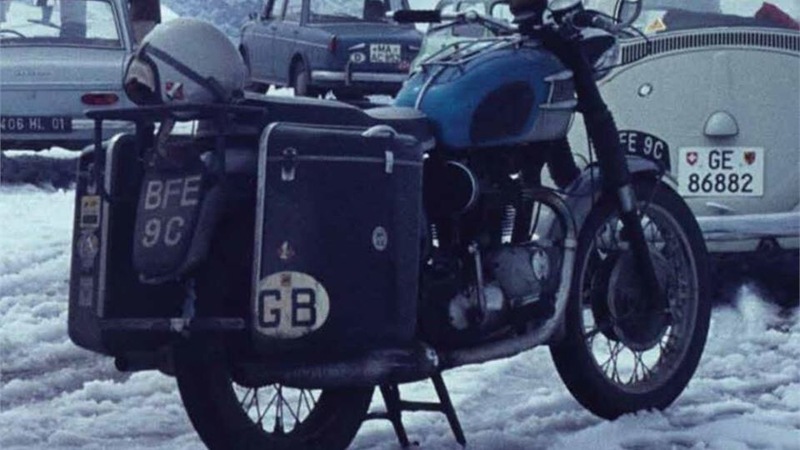 The Moto is ’64 registered Bonnie, a very early unit engine. With the Gallic and Helvetic license plates in the background this is probably Geneva. Busse Woods, Cook Co. IL – 80’s photo of youthful Acid Kings front woman Lori S. at her teenage hangout. Summer days (daze?) inspiring her stoner metal sensibility. Fast cars and a smile – Happy Birthday Paul. 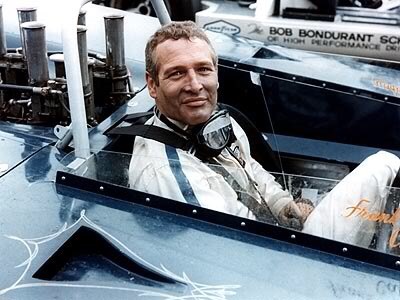 He would have been 92 today. 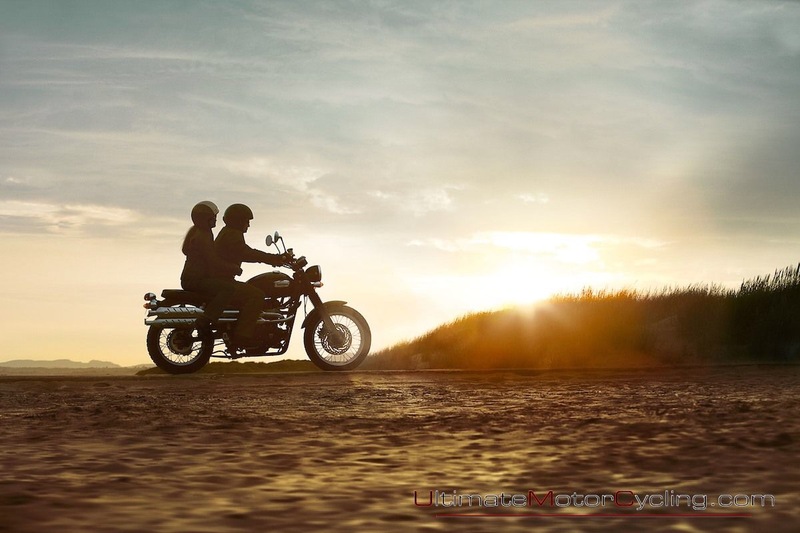 Heartland – like some photojournalist capture from days past here sits a laden Triumph Thunderbird under a Central American sun as the owner takes respite in the shade of a roadside shack near Tamaulipas. 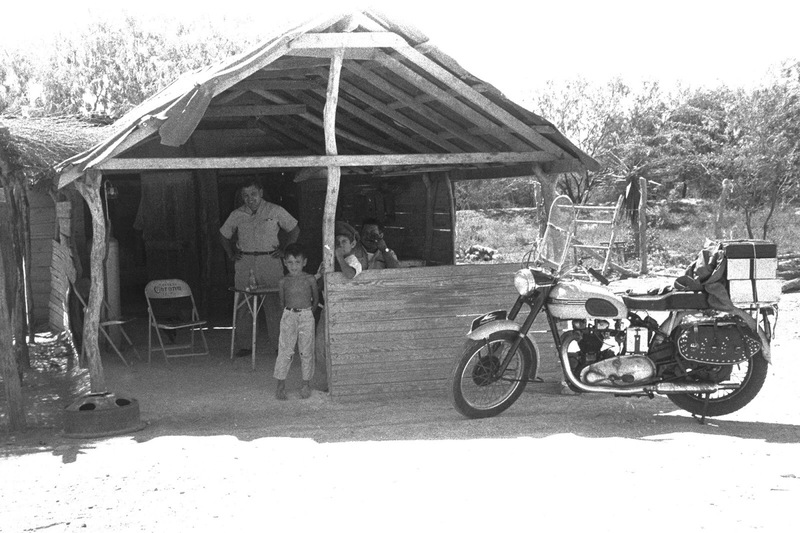 The rider is Chicagoan Michael James, who, like some latter day Che Guevara & Alberto Granado went out to find the world; though this was in 1962 only 11 years after comrade Che’s epic travels. James went on to open the Heartland Cafe which still serves food about five blocks from us here. Thatched – perfect English scene of a pair of couples heading out for a jaunt along some country lanes in the Home Counties. 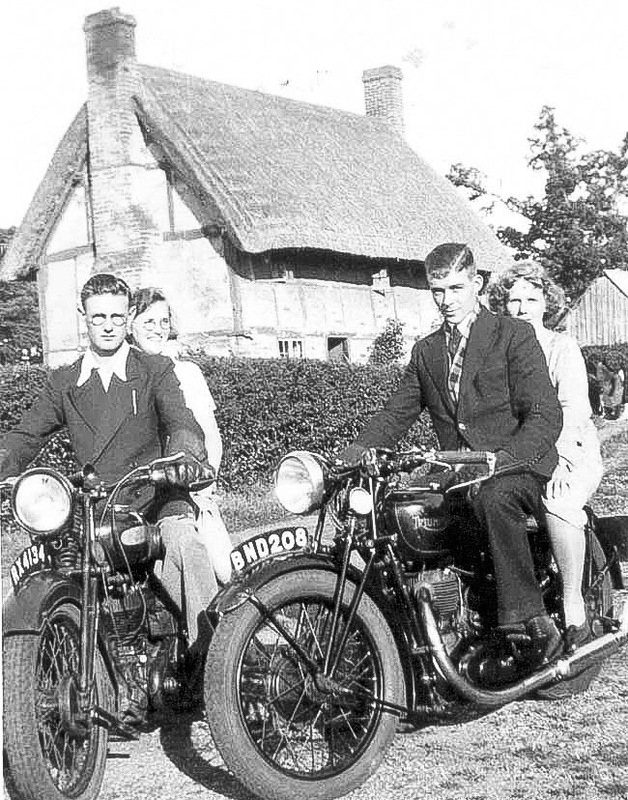 Stopping off for a pint at The Bull Inn, the local pub at Arborfield in Berkshire where this photo was taken. 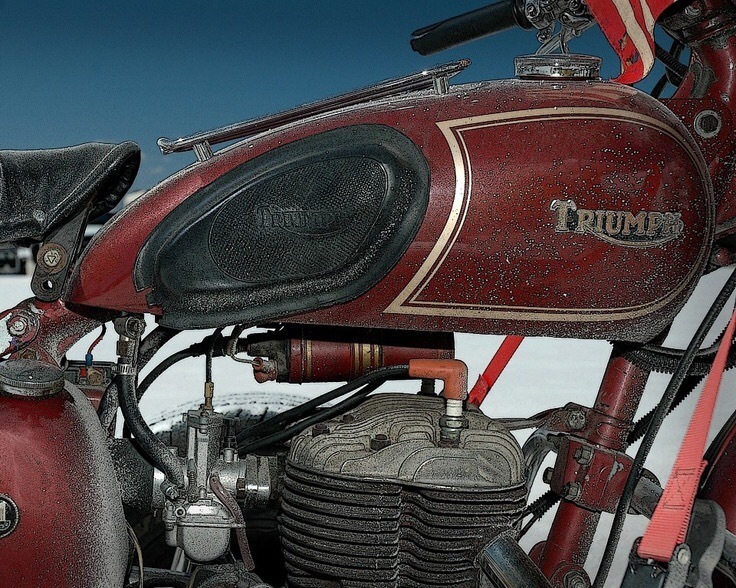 Ready Salted – glorious Triumph TRW sidevalve twin parked under what looks like the clear blue skies of Utah. The Bert Hopwood designed engine was put to practical use in the British forces during the very latter parts of and after WW2. None were sold publicly so all are ex-service. This well worn example appears to be utilized for speed work on The Flats. Women’s March – today, January 21st, saw multiple gatherings, rallies and marches in cities across the country to protest against the new potus and his policies against women, minorities, LGBTQ, and liberal thought. 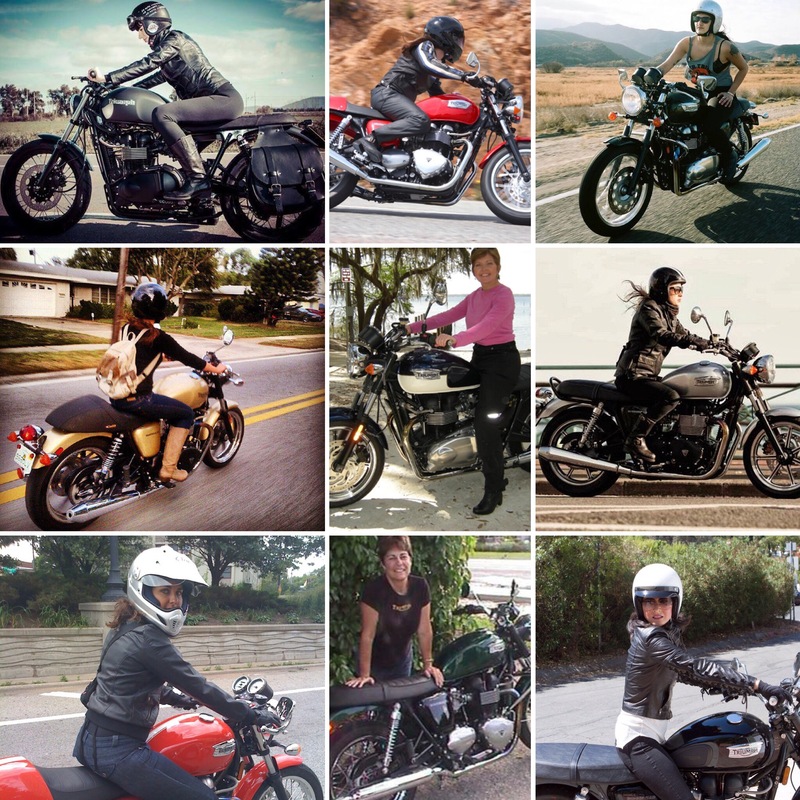 Here are a some proud ladies and their Triumph motorcycles all enjoying their freedom of the road. Neon – 102 years ago today French inventor Georges Claude patented the gas discharge tube, more commonly known as a Neon Tube. Formed into pictographs and writing they herald a company’s identity or message. 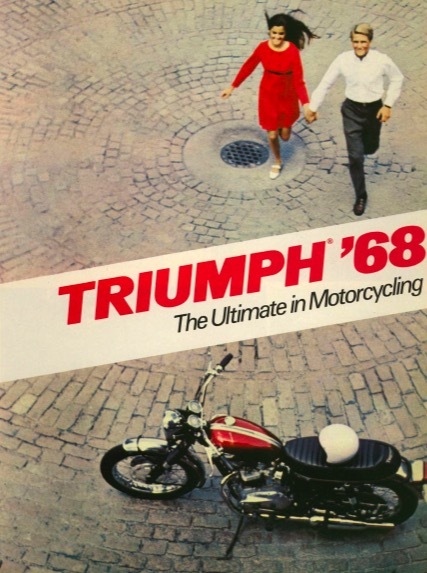 Forty Nine Years Ago – red ‘n’ white couple run in spinning imagery towards a crimson tanked Bonneville. I like the composition of this image. 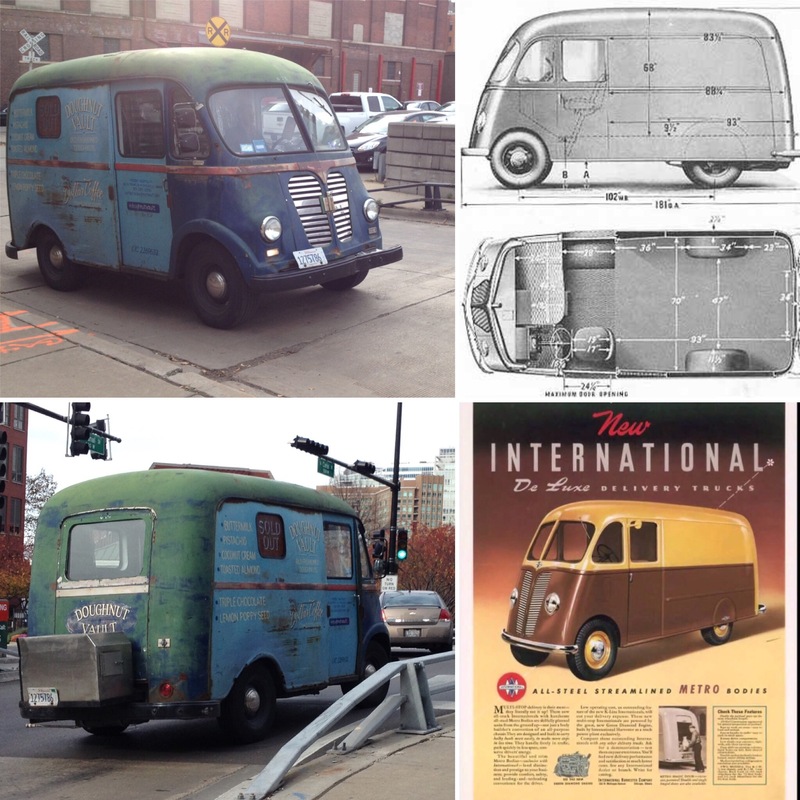 Giant Scarab – I spotted this patina-rich coffee & doughnut van scuttling about the City recently. Elegant hand painted script cheerily advertising a morning refreshment for construction and office worker alike. It’s a doughty International Harvester Metro Van, produced between 1938 and 1975 keeping its distinctive flowing form well into the sixties when its edges were squared off to meet a demand for something new. The flowing gumdrop lines were created by the capable hand of Mr Streamline himself, Raymond Loewy.